You are here: Home / Ask an Expert / Ask an Expert: How Can B2B Companies Use Videos and Images for Better Online Marketing? Ask an Expert: How Can B2B Companies Use Videos and Images for Better Online Marketing? Consumers are 44% more likely to engage with brands if they post pictures than any other media (ROI Research) and viewers are 85% more likely to purchase a product after watching a product video (Internet Retailer). While these statistics about images and video are about consumer behaviors, last time we checked, B’s are people too! 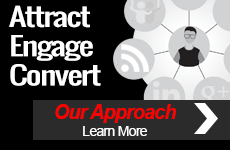 TopRank has helped a number of B2B companies execute visually creative strategies, establishing touch points across the sales cycle to create more compelling content experiences for business buyers of everything from hardware to services. Before you begin reserving digital marketing dollars to create videos or invest in photography, you first need to define what your customer’s pain points are and what brand story you’re going to tell. Modern content experiences are driven by storytelling and nothing elevates the conversation more than compelling visuals. By all appearances, this leader in marketing SaaS market share understands the hub and spoke approach to integrated marketing that TopRank has been evangelizing for so many years. Their use of visuals, with both video and imagery, presents their desire to create an engaging experience for prospects and customers alike. What’s most compelling is Salesforce.com’s complete focus on the customer, from showcasing customer success stories using video to infographics targeted to a company’s sales force. Their production values rival any Madison Avenue television commercial or print ad. If you want to raise the bar like Salesforce.com, here are a few things to keep in mind to ensure you integrate your visual content strategy with your digital marketing mix. It may seem disingenuous to answer a question with a question (several! ), but this is one way to help you dig deep and articulate your visual marketing mission. If you want to grow your business, you no longer have a choice but to think more like a media company and media companies are definitely visual. What images would your users expect to see from a brand leader in your industry? Remember to stay consistent with your own brand and forget about your competitors’ cat photos. 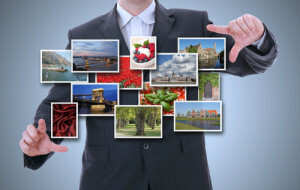 Are there ways to leverage images or video from your existing customers? After all, everyone has a phone in their pocket. How can you weave photos, videos and other visual media together to tell a cohesive brand story? For example, how might you tie in a recent trade show, social channels and live interviews into a story that connects with your B2B buyers? Is there a way to use video or images to address your target audience’s informational needs as they move from awareness to consideration to purchase? If your customers see an image, will they make the connection in a few seconds? That’s why the saying, “A picture’s worth a thousand words” has such deep meaning. As you work through this list, brainstorm ways to combine usefulness, inspiration and empathy to inform your visual messaging. While images and visuals are staples in the consumer marketer’s toolkit, B2B marketers can leverage them too. Over time, a B2B visual marketing strategy will create a ripple effect with your customer base who will want to share your story and do business with you too. Not every B2B organization has the processes in place to integrate the multitude of ways you can now engage with your customer. Just remember, quality counts. 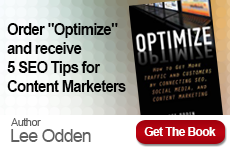 If you don’t have the internal resources to execute what Joe Puluzzi, Founder, Content Marketing Institute, calls “epic content marketing,” consider consulting with the team at TopRank Online Marketing. Check out some of our visual content examples in the resources section.